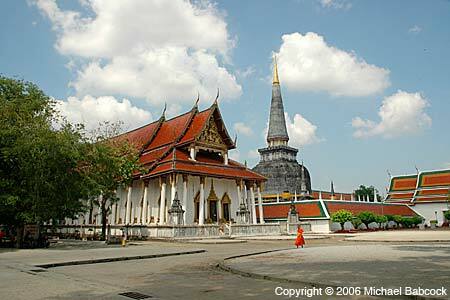 Here’s a picture of the main chedi (stupa) at Wat Mahatat in Nakhon si Thamarrat, in the South of Thailand. It’s one of my favorite temples in Thailand. As you head toward the chedi, to the left is an entrance to a building with a large number of Buddha statues around a courtyard – well worth a look. Note: This will be our last Wednesday Photo post for awhile. We may start them up again sometime in the spring. How do emergency rooms in Thai hospitals compare to those in the United States? Last year when I was in Thailand (it was January) I began having symptoms of a stroke. I went to the emergency room at Bangkok Hospital Medical Center in Bangkok for treatment. Recently, back in the United States, I had several of the major symptoms of a heart attack. I went to the emergency room at Alta Bates Hospital in Berkeley, California for treatment. One difference: in the U.S. Hospital, no treatment took place until I signed off on a financial responsibility form. In Thailand, there was no mention of payment until the very end, when I was sent to the cashier to settle up. Another difference: in the U.S. about half the nurses were male, in Thailand they were all female. The doctor is the U.S. was female (a Chinese woman) and I had two doctors, one male, one female, in Thailand. Perhaps the most interesting comparison of the two hospitals comes from the bills. Both visits were for roughly similar conditions and required major tests – at Alta Bates (for the heart symptoms) it was an EKG and a chest x-ray; it Bangkok Hospital (for the stroke symptoms) it was a CAT scan of the brain. Now in the U.S. I had insurance that paid for all but $50 of the ER visit; I have no idea if the hospital gave me better rates because of an arrangement with the insurance provider. In Thailand I had no insurance and paid the bill myself. For comparison purposes, I am using the historical baht rate on 1/22/10 of 32.992. *Tests includes all x-rays, ekg, CAT scan, etc. Why the discrepancy in costs? Both hospital offered equivalent, excellent service but in the United States it cost me over 8 times as much. They are different economies and it is cheaper in general to live in Thailand; nonetheless, that is a huge difference. Of course, in Thailand the patients don’t have to support an entire insurance industry and pay millions and tens of millions of dollars to the insurance CEOs. I’m guessing medical malpractice costs are less. In Thailand the hospital CEOs and top administrators probably don’t make as much as in the U.S. Doctors don’t make us much, though they live a very comfortable life style. I’d like to see the people studying medical costs take a visit to Thailand and find out how they can offer pretty much the same service for so much less. Kasma has her tour groups stay at a hotel right at the intersection of Sukhumvit Road and Sukhumvit Soi 55, popularly called Thong Lo (but pronounced “Tawng Law”) so we’ve had many opportunities over the year to enjoy the lively street scene. Heading towards the higher soi numbers on the odd soi side right past Sukhumvit there’s always vendors right on the street in the morning, selling everything from aprons to delicious Kanom Krok (Grilled Coconut-Rice Hot Cakes) – see Siripon, Maker of Kanom Krok. 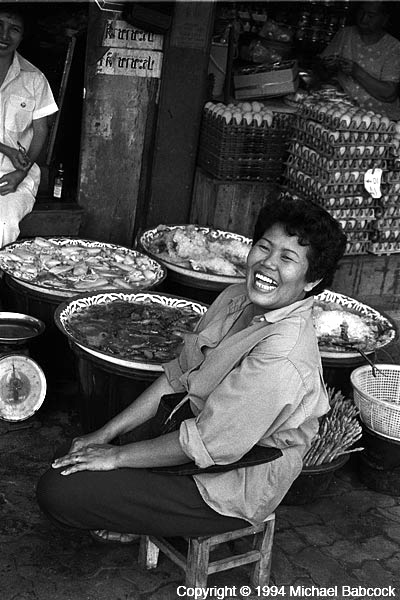 I recently began scanning some of my old black and white negatives onto the computer and came across this seafood vendor. Most probably taken in 1994, on one of my very first trips to Thailand, seeing her smile, even after all this years, brings a responding smile to my face. 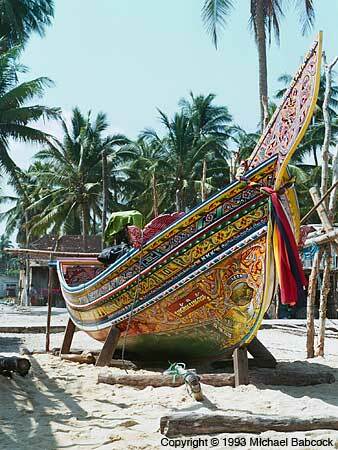 Pattani province, in southern Thailand, is famous for its painted, long-tail fishing boats. Here’s the photo of one of these famous boats that I promised last Wednesday. Be sure to see last Wednesday’s painted dragon from one of the boats. How do you deal with a burning mouth from a very hot chilli pepper? Many people do not realize that the hotness of chillies, which comes from the natural chemical capsaicin, is not water soluble. Have you ever noticed that when your mouth is on fire, no matter how much ice-cold water or beer you drink, the burning sensations linger? Water or beer only temporarily relieves the burning while you are drinking it, but as soon as you stop, you find the hot flames still leaping. 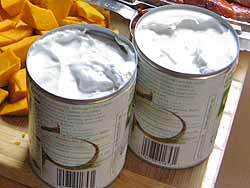 Instead of water, try milk next time, or something that contains cream or oil— capsaicin is oil soluble. 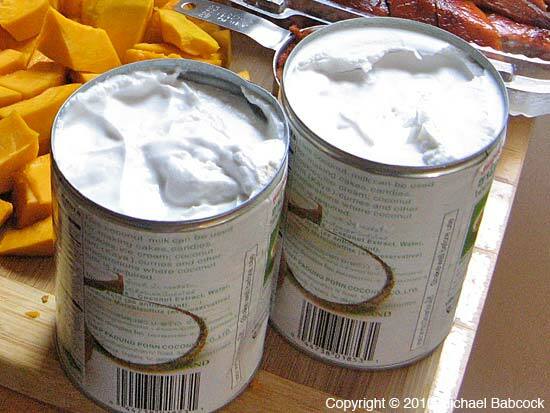 A dessert with coconut milk can end a spicy meal nicely as it douses out the fire in your mouth. Some people have also found a full-bodied red wine to help during a meal, more so than white wine. Chewing and swallowing mouthfuls of plain warm rice is another way to wipe away traces of capsaicin in your mouth—better yet, rice mixed with sauce from non-spicy stir-fried vegetables as it contains some oil. 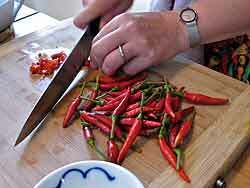 If you have sensitive skin, you may wish to take precautions when working with chillies. When slicing the peppers, try not to touch the interior lining because it contains the highest concentration of capsaicin. Hold the peppers by the shiny skin and when de-seeding, use the blad of a knife instead of your fingers to scrape out the seeds. Or, you can simply avoid the seeds all together by slicing the peppers lengthwise around the inner core that contains the seeds and hot membranes. But if your mouth can take the heat, don’t bother to deseed the chillies at all. If after taking these precautions you still find your fingers burning and throbbing, wash your hands several times with a soap that contains a high concentration of oil or cream. Fresh sap from the aloe vera plant and oil-based ointments of aloe, comfrey or calendula also help relieve some of the burn. 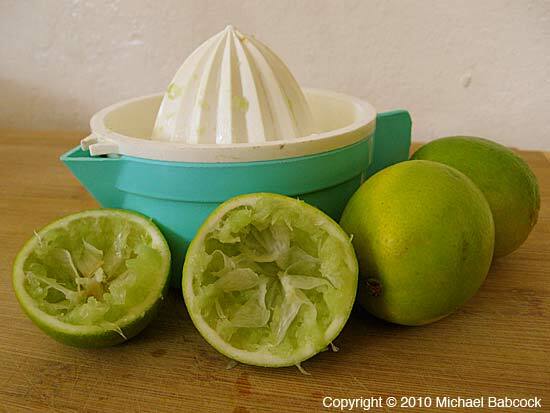 Lime juice can be effective, too, and I have heard that a strong vinegar works equally well. 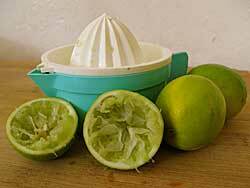 When you prepare a big Thai meal, save the rind of the fresh limes squeezed for a sauce or salad; the remaining drops of juice combined with the essential oils in the zest will help clean your hands later of traces of capsaicin. If you have ultra-sensitive skin, wearing thin rubber gloves when working with chilli peppers is advisable. Just as people with fair complexions tend to get sunburned easily, I believe that they, too, are particularly susceptible to chilli burns. Whether or not you have sensitive hands, always remember that when cooking Thai, avoid rubbing your eyes with your hands at any time. Your fingers may not burn from touching chillies, but your eyes certainly will. Capsaicin is very easily picked up by your fingers, and even the minutest trace can burn the sensitive linings around the eyes. If this accident does happen, do not panic. Wash with the suggested antidotes and avoid rubbing; the burning will fade away in time. 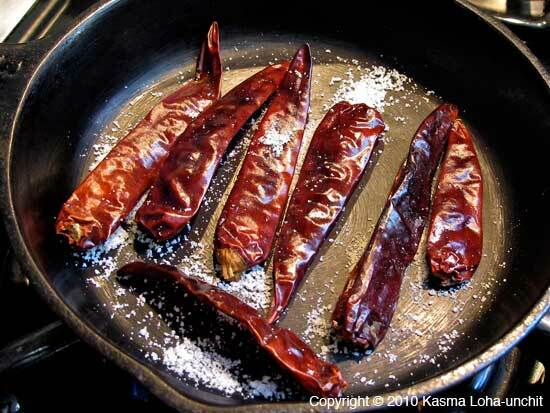 When roasting chilli peppers, especially the dried variety, make sure there is plenty of ventilation. Dried peppers can burn easily (turn them frequently and watch them carefully), and burnt chilli fumes in the air are painfully irritating to the linings of your throat and lungs. For the same reason, when stir-frying with chillies and chilli pastes over high heat, make sure the fan over your stove is turned on. Written by Kasma Loha-unchit, December 2010. The southern Thailand province of Pattani, on the Gulf of Thailand/South China Sea side, is known for its painted fishing boats. Along with Yala and Narathiwat, Pattani province is predominantly Muslim. 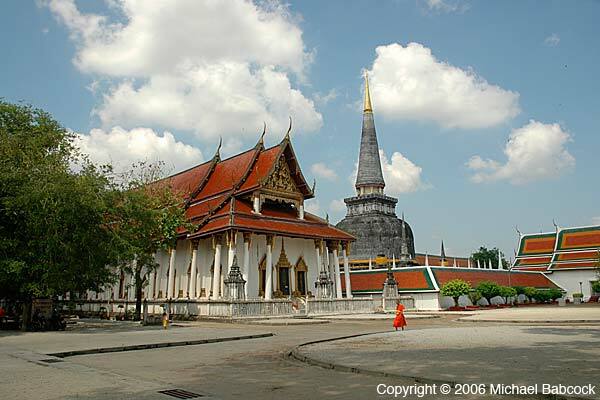 We used to travel there on Kasma’s trip to Southern Thailand but with the unrest in those provinces (there is a strong separatist movement) we’ve not been there since early 2003. 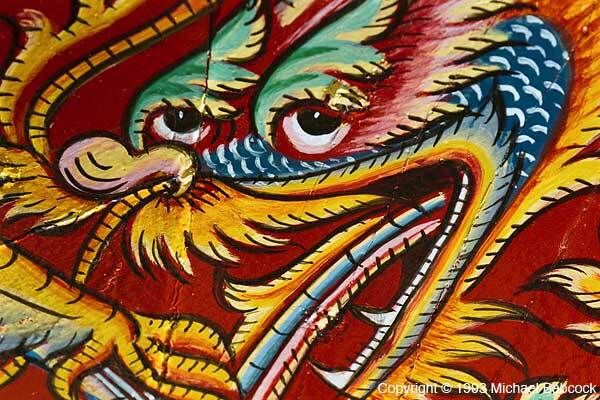 This dragon is a close-up from one of the boats. I wish I could tell you the beach where the picture was taken but I simply don’t remember. The picture was scanned from a color negative. Be sure to look at next Wednesday’s photo of one of the boats. The Wednesday Photo – a new picture each week highlighting something of interest in Thailand. Click on the picture to see a larger version. You are currently browsing the Thai Food and Travel Blog blog archives for December, 2010.